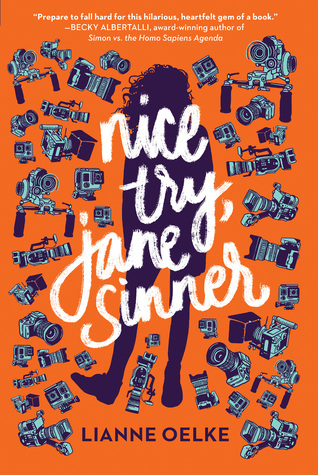 Nice Try, Jane Sinner was the book I needed this week. It was fun, witty, deep and sort of unique. The narrative choices were a little different from what I’m used to since this was supposed to be Jane Sinner’s journal, but I still loved it. I pretty much loved a lot about this book. First, I loved Jane. She was such a fun and interesting character to follow. Even when she was struggling to feel anything, she still made me feel, which made the entire experience even more intriguing. A teen expelled from school before graduation because of something she did (and you will only learn halfway through the book), Jane goes to a community college to get her degree. There, she signs up for a Big-Brother-like show produced by one of the students—the House of Orange. The whole reality TV setting was amazing, and it served as the perfect background for this journey. It made Jane face the kind of challenges that were at times entertaining and silly, but allowed her to put herself out there and grow. It also introduced her to a bunch of people that helped her come into her own. All the contestants were interesting and well-developed, but Marc and Robbie were definitely the ones I liked the most. That’s probably because they were the ones to interact with Jane for the longest period of time. Robbie was the friend, then not-friend, then love interest. And Marc...well, he was the subject of Jane's hilarious experiment, which was one of the funniest parts of this book. Carol, Jane’s sister, was another favorite of mine. Her relationship with Jane was nuanced and made for some touching moments. Like I said, there’s romance, but it isn’t the focus of the story. This book is all about Jane’s struggles and her journey to finding herself. There’s talk of religion, depression, suicide, mental health, sexuality and a lot of other serious things in a snarky, fun but also deep way. It’s hard to say much about this book without giving out major spoilers, but I can definitely say going into it knowing little about what the story was about made the reading experience better. If you're looking for a humurous story with awesome characters and beautifully done on-page character growth, then this is definitely it.